We will gather for the Army – Navy Party, Saturday, December 9th 3:00 at Paul’s Deli in New Town, Williamsburg to watch the game and cheer on our team. Since Navy will be the only major sporting event on television, we will have plenty of room for everyone to bring family and friends. It is a pay as you go food and drink menu with plenty of choices and great ambiance. For 2018 we are planning a VA Peninsula Chapter event every other month. We will vary the locations up and down the Peninsula to encourage new members and explore new venues. We invite anyone interested in taking the lead or assisting on any event to step up. We also encourage you to promote the VA Peninsula Chapter to alumni who may in the area but are not currently active in the Chapter. We offer a way to connect with old friends and meet new ones on the greater Peninsula. January will begin the year with a VA Peninsula Chapter organizational luncheon to review our current status, discuss ideas and refine plans. We will meet at Center Street Grill, 5101 Center St, Williamsburg at 1:00 Saturday January 20th. March – we are working details for either a luncheon, brunch or dinner at James River Country Club in Newport News. May – We are arranging a Gauthier Vineyard tour and wine tasting in New Kent County where we will invite the Hampton Roads Chapter (HRC) to join us again. This tour continues to receive rave revues. May is also the Plebe Recognition Dinner in Norfolk hosted by HRC. July – To escape the summer heat, we will be spearheading some family fun at the new indoor golf tavern, Revolution Golf and Grille, 1430 High St, Williamsburg. September – Congressman Wittman (R-VA) luncheon at Patriots Colony in Williamsburg. Congressman Wittman is President of the Academy’s Board of Visitors and a key member of the House Shipbuilding Caucus. Oct/Nov – Founders’ Day Luncheon, Brunch or Dinner at Riverside in Old Yorktown. December – Army / Navy Gaem 2018. Please forward suggestions and questions anytime. On Sunday Feb 19th we held a luncheon at LaTienda in Williamsburg. Don Harris talked about his career as a Navy Chaplain and how he gained an extensive knowledge of Spain, its culture and especially its fine food. Upon retirement from active duty Don found himself in the Spanish import business which soon evolved into his current Spanish Market and Tappas restaurant. If you are interested in outstanding authentic Spanish food try LaTienda, of if you are thinking of travelling to Spain, stop in and ask Don for advice. You will enjoy the time you spend engaging Don in conversation. In early January we conducted a membership drive and had 35 alumni sign up and pay dues for 2017. This has helped us focus on our core constituency based in James City County. Our members receive discounts at Chapter events and also a free luncheon with Congressman Wittman at Patriots Colony at Williamsburg (PCAW). Our 2017 calendar has a tour of Gauthier Vineyards followed by wine tasting on May 6th. Mo Gauthier ’69 will show us his new wine cellars and host the wine tasting. It is rumored a few of his classmates and a room mate will drive up from Tidewater and join us. June 19th Patriots Colony will host a free luncheon for current members with Congressman Wittman as our Keynote Speaker. He has served as Chairman of the U.S. Naval Academy’s Board of Visitors since 2010. Congressman Wittman serves as the Chairman of the Seapower and Projection Forces Subcommittee. In addition, as Co-Chair of the Congressional Shipbuilding Caucus, he is a staunch advocate for a robust Naval fleet and a healthy domestic shipbuilding industry. Late July / early Aug we are planning a cookout to include families. October will be our Founders’ Day Celebration at a local restaurant with PEO Carriers as our tentative Speaker. December we will gather at a local Williamsburg location for our annual Army / Navy party. If you have any suggestions or questions contact me anytime. The Williamsburg Chapter is continuing the transition we started last year. Our central theme has been to be more inclusive of Alumni throughout the Virginia Peninsula from New Kent County to Hampton. This is an effort to make our Chapter more viable by offering a wider range of events and expanding membership. Steve Jasper has developed our Chapter’s website over the winter to enable you to keep an eye on Chapter news and upcoming events. This is still evolving and will have more features later in the Autumn. As you review our calendar of upcoming events on the chapter site above, you will notice that we have scheduled a golf outing on July 9. Before we enter into a contract, we need to determine what the interest level is. Other local Alumni Chapters have had difficulty supporting a golf outing during the summer. Are you interested in attending a golf outing on July 9? If you are, would you prefer Ford’s Colony Golf Club in Williamsburg or an alternative golf course in the Yorktown/Hampton area. Please make you responses to Howard Russell at hsrussell@cox.net by April 29. One of the first things we have done is add a bi-monthly Happy Hour at 2nd Street Bistro in Kiln Creek, Newport News. The next Happy Hour is May 12th 5:00 – 6:30. This gives our Newport News, Hampton & Yorktown alumni a chance to join us after work occasionally. Just this past weekend we visited Gauthier Vineyards in New Kent County. Mo & Sandi Gauthier ’69 hosted an excellent wine tasting. We had over 2 dozen attendees. Check out the pictures posted on our Chapter website. Vineyard and Winery located in scenic New Kent County. We just submitted a revision to our bylaws officially changing our name to “Virginia Peninsula Chapter”. This will better project our mission to reach additional Alumni for some comradery beyond James City County. Our Chapter has 44 dues paying members. Your $20 annual dues enable us to offset the cost of our Army – Navy Party, donate $300 to First Flight, $250 toward the Plebe Recognition Dinner each June and sponsor candidates interested in the Academy’s Summer Sessions. We also are in the process of acquiring new nametags for members & spouses at a cost of $12.50 each. If you haven’t already, please send in your 2016 dues. Currently we have over $4,000 in our treasury and we intend to finish each year with at least that much. In September or early October we will conduct another Founders’ Day event with Congressman Rob Wittman at Patriots Colony in Williamsburg. The luncheon will again be free for members. December 12th we met at the Governors Land Two Rivers Country Club for our annual Army – Navy game get together. This is a great setting with a fine view of sunset on the James River usually about the time Navy has beaten Army. For the first time in many years our comrades from West Point did not join us. Maybe they will join us this next year since Army’s chances of winning might be better? 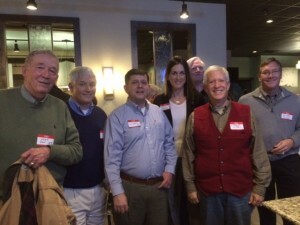 As a part of our expansion Steve Jasper and Howard Russell hosted a Happy Hour at the 2nd Street Bistro in Newport News on Thursday January 28th. We plan on doing this regularly on a bimonthly basis; our next one is on Thursday March 24th. In attendance were Spence Witten’78, Kevin Joyce’03, John Hilt ’59, Lou Gomez’85, Larry Raithel’76, Tim Moon’79, Chip Jones’79, Steve Jasper’74 and Howard Russell’71. February 13th we held a Dark Ages Luncheon at the Peter Chang Restaurant (www.peterchangrestaurant.com ) in Williamsburg. 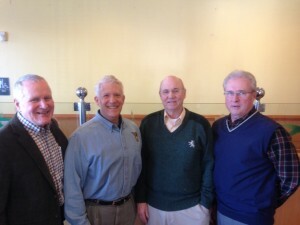 Four members shared their stories of their new ventures in “retirement”. Al Whitaker’60 is an owner of our local microbrewery; AleWerks (http://alewerks.com/). Al explained his keen interest in beer from an early age, how AleWerks began, recreating the Colonial Williamsburg historical beers, AleWerks recent expansion with a tasting room / patio and plans for doubling their capacity this year. Bill Riffer’68 is very active in the William and Mary Christopher Wren Society (http://www.wm.edu/sites/cwa/?svr=web) as both an instructor and on the Society’s management team. This is a very popular William & Mary offering for retirees to attend outstanding college courses. Bill’s “History of Submarine Warfare” fills up immediately each time it is offered. Mo Gauthier’69 shared how he and his wife became owners of an Equestrian Center and Vineyard in New Kent County ( www.gauthiervineyard.com). We plan on visiting the Gauthier Vineyard on April 16th for a wine tasting and again October 8th when they cohost a Veterans benefit. During the week Mo stays busy being the CEO of VSE Corporation.